It’s been nearly two weeks since Donald Trump’s new Attorney General William Barr released a “summary” of the Mueller report that was so comically slanted in Trump’s favor, most people don’t believe a word Barr is saying. Members of Mueller’s own team have since revealed that Barr is being dishonest about what’s in the report. We’ve all been waiting for Deputy Attorney General Rod Rosenstein to step to the plate. He just did – but it’s a complete disaster. 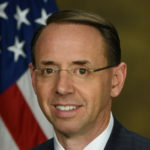 Rod Rosenstein is the only person, outside of Mueller’s team and Barr, who is confirmed by name to have seen the Mueller report. Rosenstein is also in the process of losing his Deputy AG job, to the point that Trump has already nominated Rosenstein’s replacement. That means Rosenstein is in prime position to publicly blow the whistle on Barr, and reveal the gist of what the Mueller report really says. Instead, Rosenstein is suddenly claiming that Barr is handling the Mueller report perfectly. In a mind-numbing interview tonight with the Wall Street Journal, Rod Rosenstein said this about Barr’s handling of the Mueller report: “He’s being as forthcoming as he can, and so this notion that he’s trying to mislead people, I think is just completely bizarre.” Wait, huh? What does this guy think he’s trying to do here? Rosenstein is completely full of crap on this, and he knows it, and he surely understands that by saying this, he’s throwing away his reputation forever. So what’s he doing? Rosenstein suddenly sounds like a guy who’s auditioning for a new job in the DOJ or in Trump circles, and he knows that to pull it off, he has to get on the good side of Trump and Barr, no matter how foolish he looks in the process. This harkens back to when James Comey once said he was concerned that Rosenstein was a “survivor,” which is code for willing to do anything to keep his career intact. In any case, there’s only one question here that matters. Rod Rosenstein’s public words tonight aren’t going to change a single mind when it comes to how the public views William Barr’s handling of the Mueller report. What matters is that Rosenstein was in charge of overseeing the Mueller investigation the entire time it went on. Was Rosenstein playing these kinds of pandering games then too? It’ll all come out in the wash.